I'm in a bit of a pickle and don't really know if can solve my problem with SharePoint. My company wants to build an organizational chart (easy, right ?) that will allow us to know every job that we have and ultimately where we have open positions. So first, we want to know back at HQ the organizational structures of each region and country. After this, we want to be able to flag if a given position is filled or not and be able to collate the number of open positions globally (e.g. something like "3 manager positions available | 3 employees positions available" etc... and then go into details for which region, country, it's opened). I'm in the process of gathering the data on an Excel file. I'm sort of struggling to see how I can then translate this to SharePoint. I checked what I can do with importing my Excel in Visio and then publishing to SharePoint, but it's just a frozen picture, so not really a solution. 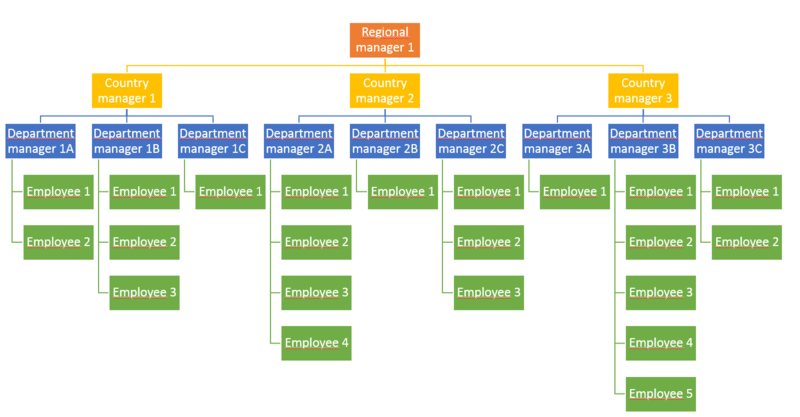 You can create List structure and add data into list from excel and the use Jquery Charts to achieve your organization charts. Fetch data from SharePoint List using Rest API or CSOM on client side. Create either JSON Structure or HTML Structure depending on Widget or Plugin for Org chart you using. You can also use SSRS to achieve this but the output is not as elegant as Jquery plugins would provide you. Not the answer you're looking for? Browse other questions tagged sharepoint-online sharepoint-designer chart-web-part or ask your own question. If a user can't read Excel file, can they still view Chart Web Part created from it?